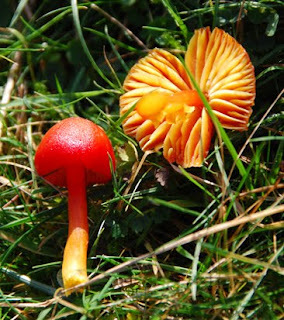 Hygrocybe coccinea (Schaeff.) is edibble and common, growing on grassland (in this case Doleburry Warren in the Mendips). As always with mushrooms use several sources to identify them and unless 100% certain of your identification do not eat them. An excellent resource is Rogers Mushrooms as is the most excellent second edition of his book. A supperb and accessable book about collecting mushrooms as food (and not dieing in the process) is the River Cottage Handbook N01: Mushrooms.